Blank cotton t-shirt in the house color of your choice. Puff fabric paint in yellow (for Gryffindor) gold (for Hufflepuff), gray or silver (for Slytherin or book Ravenclaw), or bronze (for movie Ravenclaw). Click on picture for full-size image. Print iron-on from above onto iron-on transfer paper, following the manufacturer's instructions. Iron the iron-on to the middle of the front of your shirt, also following the manufacturer's instructions. Fill in the pencil with puff fabric paint. Allow to dry completely, then turn to the back. 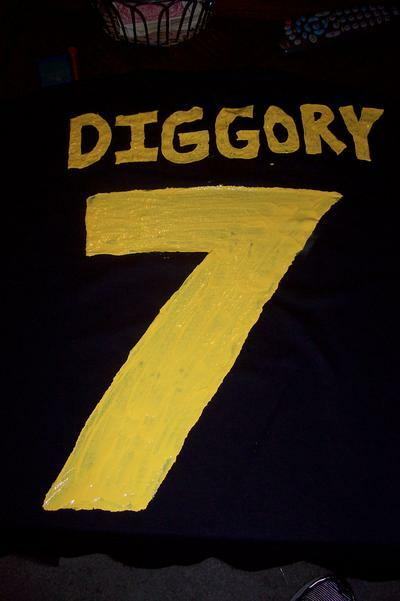 Pick your favorite Quidditch player from your chosen house. Fill in the letters and numbers with the puff fabric paint. 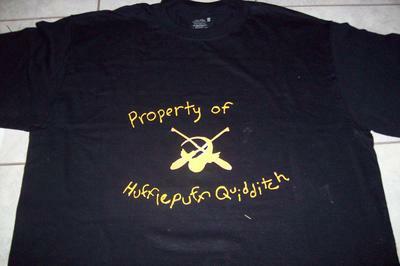 Follow the manufacturer's drying recommendations, then enjoy your "Property of" Quidditch Shirt! Gingin77's pattern was taken with permission.